The humble Brussel Sprout can be a little difficult to grow, however they are a productive plant, high in vitamins. You can grow them in the garden or in containers, and as they grow up rather than out they can be grown in smaller gardens as well. Growing Brussel Sprouts in the Australian home garden is not as popular as it is in Europe and the UK. Brussel sprouts are really a cool climate vegetable, in warmer areas the heads tend not to form and become loose. Brussel sprouts are a fantastic vegetable, just remember not to overcook them. Brussel Sprouts require the same conditions as cabbages. A cool climate, plant them in spring for summer / autumn harvesting and late summer to autumn for a winter / spring harvesting. Sow seed in seed a punnet or tray and plant out as seedlings develop. In Cooler areas Plant Brussel sprouts as seedlings in late summer to early autumn ready to harvest for Christmas . A humus rich well drained soil is best, do not allow to dry out. Start seeds indoors or in a cold frame. Plant out after danger of frosts is over. Seeds can be sown directly in frost free areas. Thin seedlings to around 30 cm apart. In containers generally one plant to a large pot. Keep the soil moist and avoid digging around the roots which are close to the surface. Pinch out the top of the plant after 12 weeks to speed up growth. 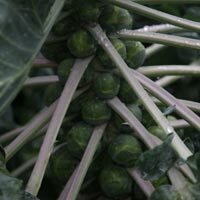 Avoid high nitrogen fertilisers to prevent the sprouts ‘browning’. Harvest from the bottom up after around 10 weeks.